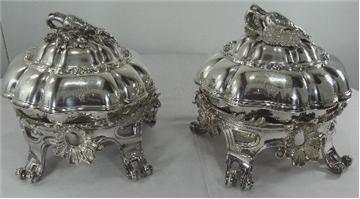 RARE pair of sterling silver covered vegetable or entrée or casserole dishes on silver-plated stands, with burners, by Odiot, Paris. The condition is wonderful - The overall height of each covered dish, on the stand, is 9”; the height of the covered dish is 5 ½”; the width of the covered dish is 9 ½”. The height of the stand is 4”; the width of the stand, over the feet, is 11 ¼”. Notice that each covered dish has a different vegetable - one is a 3-dimensional carrot; the other is a 3-dimensional turnip (I think). The total weight of the pair of covered dishes is 87.7 T.O. The photos will show all the details, including the hallmarks.